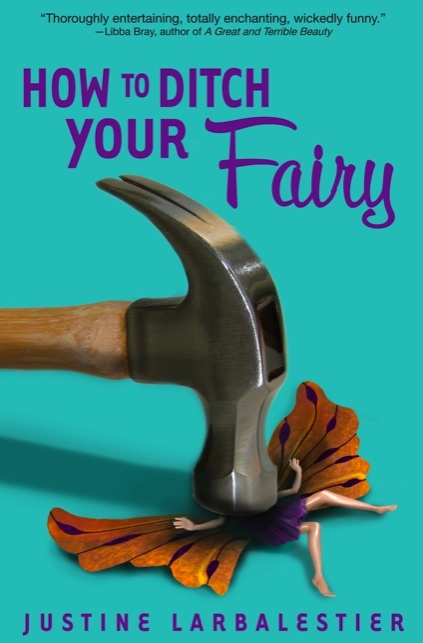 Did I mention that I have a new How To Ditch Your Fairy cover for the US paperback? Is it wicked of me that part of the huge pleasure I get from this cover is that mutilating barbie dolls was one of my favourite games when I was little? I doubt that I will ever again have such a genius cover. Bless you cover gods! Posted in Covers, How To Ditch Your Fairy, Praising. This really is one of the best covers of all time. This is making me want to go out and find a Barbie of my own. Cover is fantabulous! I love what they did with the wings. It is all both pretty and evil. OMG you’re right- that is the best cover of all time. I laughed and snorted when I saw it. It’s awesome- I’m definitely gonna have to buy a copy when it’s released, lol. You gonna write a sequel featuring a hammered unicorn? Ahaha! What a satisfying cover. Such a nice solid hammer, too. Oh man, that’s awesome! Violently awesome! …I was once Wednesday Addams for Halloween solely as an excuse to chop the head off one of the old Barbies sitting around the house. You are so lucky! What a stunner of a cover! Hope you get sent to Seattle on your next tour. That is ABSOLUTELY an awesome cover. It makes me grin and feel wickedly pleased. Love it. I may have to buy a copy of the paperback even though I have the hardcover. I can’t wait to order that into my store and put it on my new release shelves! Wicked cover! But this is definitely one of the BEST COVERS OF ALL TIME! Capitals mean I’m serious, y’all. This is definitely in my top 5 favorite covers of all time. There is no way I could not pick this book up off the shelf if I saw it in the store!! This is a great cover. Its got that elusive quality of being simple and striking, i.e. it will grab the eye when making a quick scan of books. Plus it produces an immediate curiosity – is the book really about hitting fairies with hammers? congrats on a lucky one! Fabulous cover, I love it. So do you know if the other cover is still available? I actually like that one better. But, I will say, I have never seen a cover like this one before!! Glad you like it, since you’re the author! Oh my gosh, that is the best cover I’ve ever seen. I busted up laughing and I was rolling from side to side for over a minute. And even then I couldn’t glance at my computer before bursting into fits of giggles every single time. If I didn’t love the book already I would have to buy it just for this. I’m not a paperback girl, but this really may be an exception. Completely awesome cover! Bring on the fairies – I got me a hammer! This is hysterical– I love the smashed Barbie doll! lol I love it! I guess today you’ve got a good cover art fairy. Great cover! I’ll never be able to own it though, because I bought your book hardcover already. 🙂 Great, by the way, kept me reading to the end.